The best training for boxing -- or any other martial art -- is live instruction from a qualified trainer. However, not everybody has access to a boxing gym. If you're on your own, you can still get started with your boxing skills by practicing in a home workout space you set up on your own. Internet and video resources can help you learn new techniques while you practice the basics incessantly. Set up your training space. You will need a clear area at least 10 feet on a side, and a punching bag. If you can't hang a punching bag from your ceiling, you can get free-standing punching bags at most sporting good stores, or from martial arts supply catalogs. Practice a specific technique, such as a punching combination or footwork exercise, two to three times per week. You can use a video, book or Internet reference to learn the basics -- or to review what you think you know if you already have some boxing knowledge. Once you've ingrained the technique, practice it for 50 to 100 repetitions on the punching bag. Do general bag work two to three times each week to work on your speed, rhythm, timing and general punching technique. For best results, work the bag in rounds of two to three minutes -- working your way up to 10 rounds of work in a training session. While working the bag, it's not enough to randomly punch the bag. Approach the bag with a game plan and scientific approach. This will help you develop the attributes you need as a boxer. Find a sparring partner to practice with from time to time. This should be another serious boxer, since somebody who isn't serious about training can become emotionally involved during sparring practice. An angry partner will become reckless and could hurt you or himself. The safest sparring happens only under the supervision of an equally serious third party, who acts as referee. Get a cardiovascular workout several times per week. 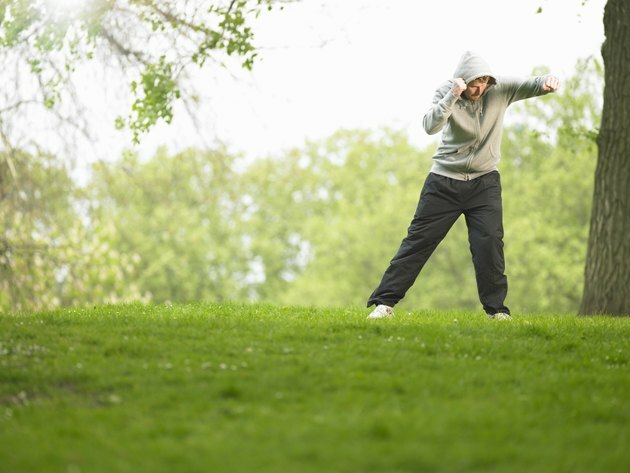 Although you won't be punching, better cardio gives you the wind you need to practice and fight effectively during the later rounds. Cardio exercises to include in your training include shadow boxing, jumping rope and running. The latter exercise is known in the boxing community as road work. There is no boxing adage truer than the old saying, "fights are won on the road, not in the ring."